Yesterday, I went to Asphalt Green to swim in the morning for the first time in over 5 months. I set my watch for 4:30am the night before and woke up 31 seconds before it went off, hoping I had at least another couple of hours to sleep. Dragging myself out of bed to go swim at 4:30am was abosoultely brutal. Even though I’ve done this dozens of times before, I am just so unused to heading to the pool after not doing so for such a long time. I felt like I was duct taped to my bed and that I somehow managed to break free of the bonds. It took me 20 minutes to drive to the pool and I easily found parking. When I entered the pool deck, I was pleasantly surprised to see that the pool was configured for Long Course Meters. This meant that I had a lovely 50 meter length to swim. I hate doing flip turns and hang turns are just not conducive to getting a proper rhythm flowing. For me, the less turning the better. I only had to swim 1500 yards and wound up swimming 1600 meters. It took a little longer to drive home, but I was back in my house just before 7am. I got to wake my children up for school and then still had time to get a 6 mile run in. I took a shot of Hammer Gel straight from the bottle and then headed out into the crisp fall air and ran a very comfortable 6 miles. Later in the day I went to SBR Sports near Columbus Circle to buy a new long sleeve wetsuit. Everything was on a blowout sale and I couldn’t pass up the opportunity to score a new suit at a cheap price. I knew I would need it for the upcoming Turkey Dip. Unfortunately, I was too late to score an Ironman Stealth wetsuit, but I did get a Orca P-Flex, which is supposed to be even better. 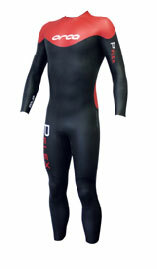 Before settling on the P-Flex, I must have tried on 3 or 4 wetsuits. Let me state that trying on wetsuits is not a fun thing to do. The neoprene causes you to break out a sweat the moment you put it on. Add that to the fact that long sleeve wetsuits are pretty difficult to get on properly. Just pulling one on is a full workout in and of itself. By the time I was done, I could barely grip anything in my hands, since they were so fatigued from pulling up the suits. In order to make my final decision on which suit to buy, I tried a couple out in the Endless Pool in the store. So here I am going swimming for the second time in the day, where previously, I hadn’t swum in a couple of months. I was reluctant to do this at first, since I didn’t want to get my hair wet. I didn’t have anything to neaten it up afterwards and I had to go back to work. Fortunately, my hair stayed somewhat dry underneath the swim cap. Back in my office, I left my new wetsuit, wet in the bag, on a chair next to my desk. Eventually I took it out and hung it up on the back of my office door. I left the wet bag on the chair. Later on someone came to see me and when she went to sit down noticed that something was “leaking” in my bag. I told her it was from my wetsuit which was still wet from swimming. I had her convinced that I took a dip in the East River, especially when she saw my suit hanging behind the door. The sad thing is you could've spent a thousand dollars on a jet-propelled wetsuit and you'd still never beat one of the fastest ironmen swimmers in brooklyn. Oh yeah, why no mention of the "reading" you went to last night?